What is the Just-In-Time process? Will Brexit affect the use of Just-In-Time by manufacturers? Have you ever looked at your car and wondered how it’s made? Making a car is not a small endeavour. Each one is made up of multiple components, from the large, like the engine and chassis, to the small such as spark plugs and light bulbs. All of these parts need to be stored until the point when they’re needed and, large or small, they take up space. Every business controls their stock differently, from places like Amazon that have warehouses across the globe that cover millions of square feet and are filled with every item you could possibly imagine, to production lines for carmakers like Honda and Nissan in the UK who keep only enough stock on site to make a small number of their end products due to their use of the Just-In-Time process. In this article we will look into Just-in-Time production, why it’s used by the automotive industry and how Brexit could affect it’s usability in the UK. Just-In-Time, which is also referred to as JIT or the Toyota Production System, is a supply chain process designed to improve efficiency in manufacturing. JIT is a system that ensures the components required for the manufacture of products are delivered ‘in time’ for use. 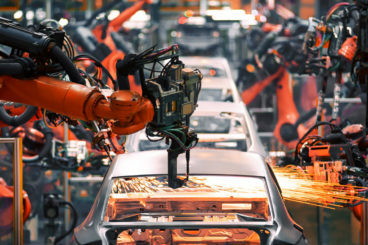 For organisations that require a large number of parts to assemble a single completed product, such as car manufacturers, using JIT is a cost-effective method. Just-In-Time makes it possible for car manufacturers, and other businesses, to operate with low inventory, removing the necessity for ‘buffer’ stock and large warehouses. 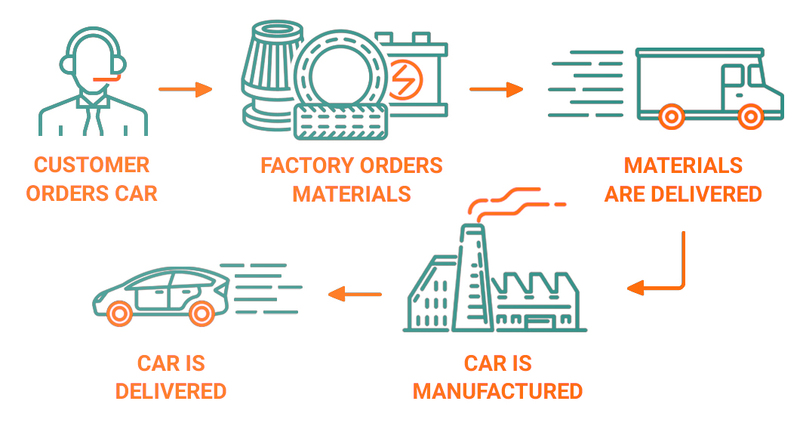 These businesses rely, instead, upon the companies in their supply chain delivering the items required to assemble a car when they are required. Who came up with Just-In-Time? Just-in-Time was developed in Japan and took over 15-years of trial and error to perfect and become the system that it is today. Taiichi Ohno, at one time a Vice President of Toyota, is credited with the creation of the system, which has been used at the car manufacturer’s factories effectively since the early 1970s. He got his inspiration from the way that American supermarkets keep their shelves stocked; a customer takes what they want from the shelves and buys it and the store then restocks with enough products to fill the space that was left. How does Just-In-Time work in the car industry? Just-In-Time works perfectly when it comes to manufacturing cars. It works on the principles of making only what is needed when it’s needed and in the quantity that is needed. When producing items on a large scale a business wants to avoid waste and using the principles of JIT ensures that this happens. Continuous process and quality improvement – JIT can only work successfully if the process is continuously evaluated and all problems managed effectively. Continual monitoring benefits quality and effectiveness. Every system, no matter how effective or efficient it proves to be, has its positive and negative points. Just-In-Time is no different. The processes involved in making the system work effectively aren’t for the development of all products or the running of every business. Prices – when you are using Just-In-Time you don’t have the luxury of waiting for the best offers on goods you need to complete your orders. When prices of raw materials/components go up, profits go down. If one of your suppliers experiences disruption and is unable to deliver their goods to your schedule then the entire production process can be completely shut down. Just-In-Time is an effective method of managing stock and can ensure that products are manufactured efficiently if the companies in the supply chain are reliable and there are no issues with delivery. However, there are also downsides to the system if there is a breakdown in communication or problems with transport of the raw materials. How will Brexit affect businesses that use Just-In-Time? On January 15 2019, Parliament voted against the deal that was proposed by Theresa May, which means that there is a possibility that a no-deal Brexit could become a reality. This could have serious implications for any business that relies upon Just-In-Time. With over 1,100 trucks crossing the Channel daily transporting deliveries intended for car and engine manufacturing plants in the UK, delays at the border could be disastrous for companies that use the JIT process to produce their vehicles. The extra time and staff that businesses could require in order to complete paperwork or delays while goods are checked at Customs could mean that production lines are left empty and customers are left waiting for their cars. Of course, no decisions have been finalised and in the interim, things carry on as normal.